The new PA15B and PA30B augers are designed for longer product life to better meet customer needs and application uses. 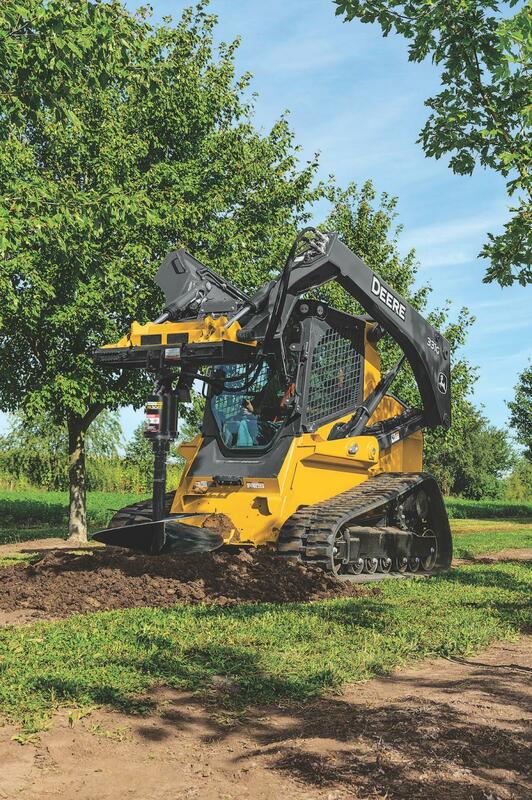 Like all Worksite Pro attachments, these solutions are optimized to work with John Deere skid steers, compact track loaders (CTLs), compact excavators and compact four-wheel-drive loaders, along with most competitive models. The B-Series augers offer new motor and planetary designs for improved toughness and longer attachment life. Enhanced hydraulic motors have a higher-rated operating pressure for better raw digging power. An upgraded integral motor and planetary gearbox housing bring the planetary gear set closer to the motor, decreasing motor stress. A five-gear gearbox with an updated input shaft and shaft seal were designed for increased durability. For heavy-duty work in terrains such as rock and clay, the max torque rating on the PA30B has been increased from 4,166 ft.-lbs. (5,648 Nm) to 4,500 ft.-lbs. (6,101 Nm), increasing attachment efficiency. The PA15B and PA30B models are compatible with a variety of auger bit styles and diameters, including standard 4- to 6-in. (102 – 914 mm), 9- to 12-in. rock and frost (220 – 305 mm), and 18- to 36-in. (457 – 914 mm) tree and shrub. The new auger attachments are backed by John Deere parts, service and warranty coverage. To learn more, visit www.johndeere.com or contact your local John Deere dealer.